Low client-side HTTP performance negatively impacts the user experience of your mobile apps. This is why Dynatrace provides tools to give you insight into the usage of your mobile apps so you can investigate issues and optimize performance. On the Mobile application details page, click the HTTP performance portion of the infographic to display the total number of HTTP requests and the overall error rate. If you&apos;ve instrumented more than one app platform, use the All app versions list to filter the list (All app versions, Android, or iOS). This list includes the HTTP domains that contain the most outgoing HTTP requests triggered by the mobile app during the selected timeframe. This chart compares the number of HTTP requests to total error rates during the selected timeframe. 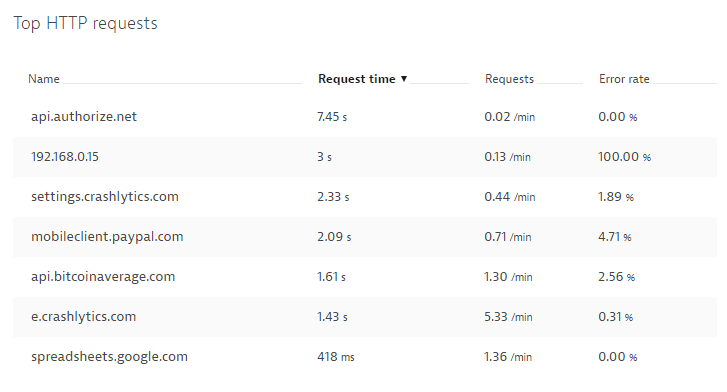 This chart compares total request performance with total HTTP payload sizes.